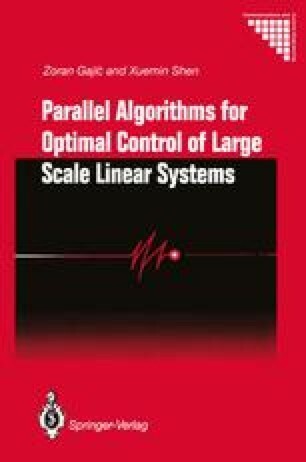 The design of the optimal linear full state regulator requires the measurement of all system states. In many practical applications, this is not feasible due to either the high cost of the state measurements or the inaccessibility for measurement of some of the system states. The standard way to overcome these difficulties is to reconstruct the full state vector from the available measurements by the Luenberger observer or, if the measurements are noisy, by the Kalman filter. However, these state reconstruction methods will introduce an additional dynamical system. That is why, in the early 1970’s, increasing attention was given to the problem of designing output constrained regulators where a very limited number of state measurements are available for control implementation (Levine and Athans, 1970; Levine et aI., 1971; Mendel, 1974; Petkovski and Rakic, 1979). The optimal solution to this control problem is obtained in terms of high-order nonlinear matrix algebraic equations. The convergence complexities of the algorithms suggested for the solution of these equations have hindered for quite a long time a wider application of this technique. The convergence problem was solved in (Moerder and Calise, 1985a; Toivonen, 1985). Since then, the static output feedback control problem has become a very fruitful research area (Makila and Toivonen, 1987).